The Handmaid’s Tale, the classic novel by Margaret Atwood, is a stunning piece of fiction. It’s a dystopian novel set in the near future when women have lost all rights and freedom and are essentially now considered property and only valuable for their ability to reproduce. It’s bleak, innovative, and controversial. Sounds perfect for Know Theatre, right? It is. But its also a modern classic, which is exactly why its smart to bring in director Brian Isaac Phillips from Cincinnati Shakespeare Company to direct. And even better – get his wife, the magnificent Corinne Mohlenhoff, to play the lead. Not only is she the lead but she’s the only person on stage. For almost two and a half hours. That alone is astounding, to me. But she’s not just reciting memorized words. She’s a true storyteller, conveying emotions of hope, despair, bewilderment, and much more. It’s a command performance, mesmerizing and fantastic. She held my rapt attention throughout. She’s aided by the tremendous set and lighting design by Know’s Producing Artistic Director Andrew Hungerford. He is one of the absolute best at what he does and the way his tech supports his actress is picture perfect. Also aiding in setting the suspense of this remarkable play is Doug Borntrager’s sound design. Noelle Wedig’s costume is both classic yet futuristic; she gets it. All the pieces come together in this show; I loved it. You should get your tickets now. Don’t wait. Today’s Sunday afternoon crowd was the biggest they’ve had and as the word gets out about this great show, it will be harder to get a ticket. You don’t want to miss it. 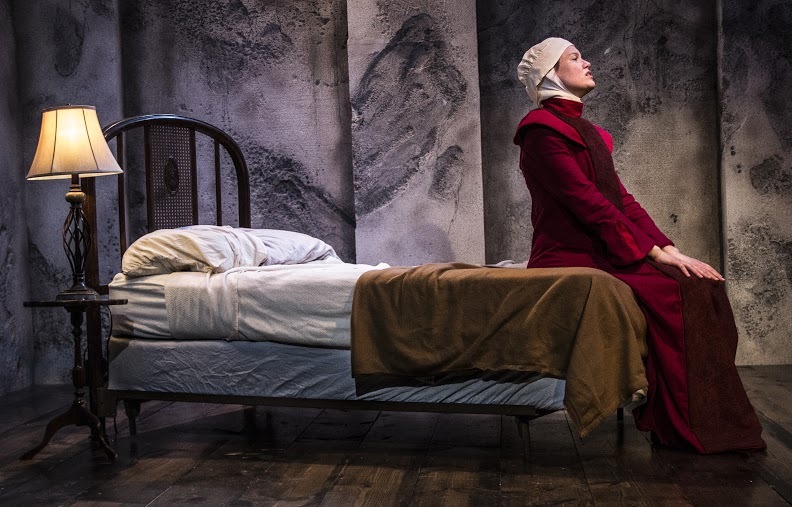 THE HANDMAID’S TALE is a tremendously engaging play about what could happen with a shift in the balance of power. It’s timely, even 30 years after it was first published. And this production is not to be missed. THE HANDMAID’S TALE runs though February 20th. There is adult language and sexual content so be advised its appropriate for older teenagers and adults. Click here for more information.